The bone broth trend for dogs and their pawrents is everywhere but could it be more than just the latest healthy pet food fad? 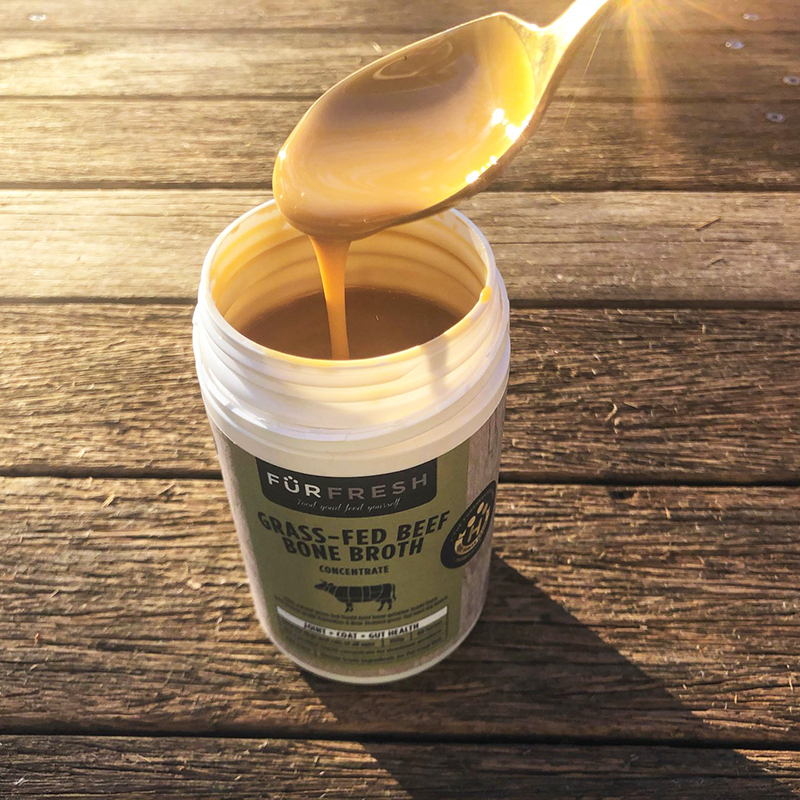 Late last year Sydney business FurFresh approached us to trial their Grass-fed Beef Bone Broth concentrate with our dogs and report on the outcome. The FurFresh option is a 100% natural grass-fed liquid beef bone broth for dogs and cats, made from 100% human-grade Australian and New Zealand grass-fed beef leg bones which have been slow-cooked at low temperatures for up to 50 hours. Yes, of course you could make your own and we have (tried) last winter ... However making broth from leftover carcasses and bones is a time-consuming and very smelly process and we certainly did not give this 50 hours of slow cooking in the pan! Using a slow gentle process is the only way to extract the most nutrient-dense marrow whilst maintaining the highest ingredient integrity. 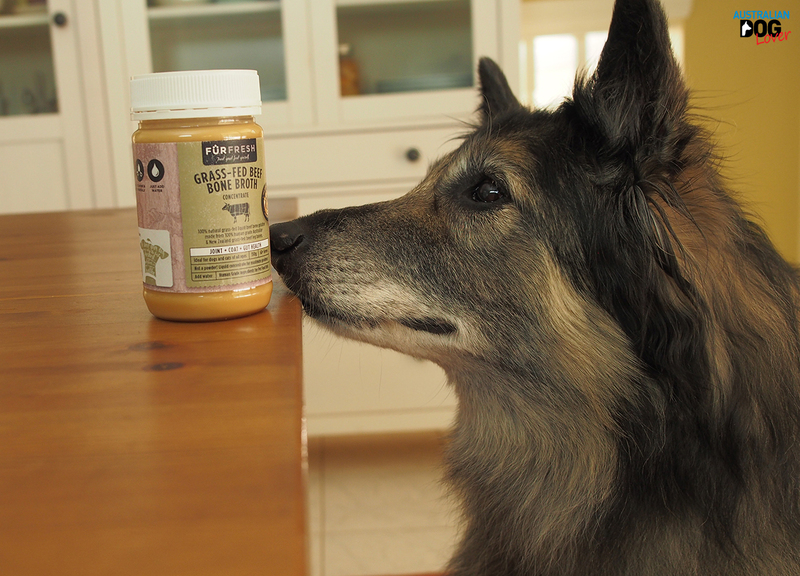 The prime candidate for any diet supplementation in our household is always our senior Belgian Shepherd. At the ‘ripe old age’ of twelve, Conner certainly appreciates nutritional boosts to his immune system plus it clearly smelled delicious to him! More importantly we're trying to slow down the onset of canine arthritis and bone broth is deemed one of the best sources of collagen and gelatine. Gelatine acts like a soft cushion between bones helping them glide without friction. Gelatin also helps maintain strong bones and support healthy bone mineral density. What is in the FurFresh Grass-Fed Beef Bone Broth? FurFresh only uses human-grade grass-fed beef leg bones and evaporated sea salt and that’s it! No hormones or antibiotics and this product is also gluten and dairy-free. Meat carcasses are packed to the brim with glucosamine and nutrient dense collagen so when you gently cook beef (or chicken, lamb or pork) bones for a long time these nutrients bleed into the broth. When you feed this bone broth to your dog or cat, they absorb those nutrients to support their own joints and cartilage which we felt would be great for our dog with mild arthritis. The gelatin collagen protein protects and soothes the lining of the digestive tract which may help dogs with food allergies and sensitivities. Containing chondroitin sulfate and hyaluronic acid and packed full of amino acids, bone broth acts like a cushion to reduce inflammation in the gut as well as intestinal permeability. Leaky gut syndrome and other gut sensitivities are common in dogs and beef bone broth can help them to restore the strength of the lining in their gut. All the hard work has been done so you only need to add water to this liquid concentrate and mix well. Using warm water makes it easier to avoid lumps! For dogs under 15kg and cats, mix a teaspoon with 250ml of water and for dogs over 15kg, you would mix 2 teaspoons with 500ml of warm water. You can use it to rehydrate dried food or moisten your dog’s kibble or simply serve it on its own as a nutritious bone broth drink. If you have a fussy eater, using it as a topping should prove irresistible! A dog who is ill or a senior dog who has gone off its food will still lap at broth. You can serve it warm during winter or cool during our hot summer months. 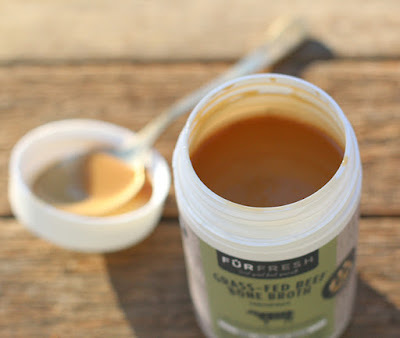 FurFresh Grass-Fed Bone Broth comes in a 350g screwtop jar that will make 60 serves so that’s two whole months of goodness for a small dog! Just ensure that you keep your jar in the fridge after opening but it can last 12 months from opening. With the hottest summer we recall experiencing in Sydney, warm broth was honestly not at the top of our list but then we had the ‘light bulb’ moment! We were finding it hard to get all our dogs to drink the recommended 70ml per kg of bodyweight (over 2L per day for each of them) so we made a few batches of icy treats using the FurFresh Beef Bone Broth. Whether you choose to serve it warm or cold, you can save yourself a lot of time and hassles by purchasing the FurFresh ready-made bone broth and with all the ingredients sourced from Australia and New Zealand, you’re supporting our 'local' economy too. 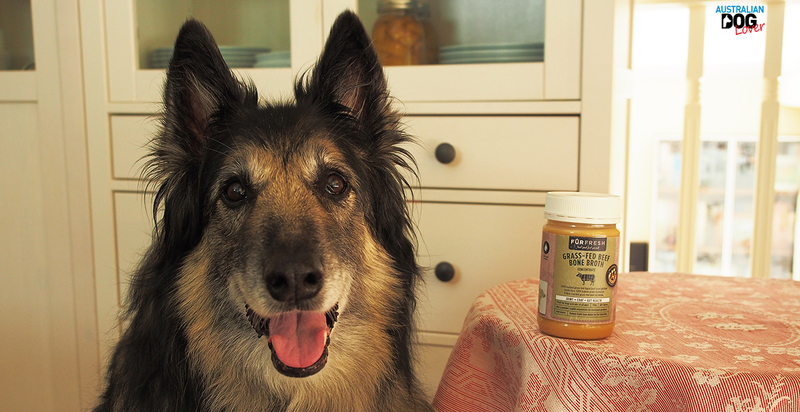 The main reason we would keep adding this broth to our senior dog’s diet would be to boost his immune system and also assist with joint pain in his hind legs. Please Note: depending on your dog’s medical condition, a dog supplement may not be enough and we recommend to always speak with your vet first to check suitability, especially if your dog is already on a course of injections or other medication. Disclaimer: a 350g jar of Beef Bone Broth Concentrate was provided to us by FurFresh in order to test the product and complete this review.